The Emerald Herald's real name is Shanalotte, a name given to her by the dragons. She was created specifically to break the undead curse, but her creators failed. She aids undead in an effort to break their curse. The Emerald Herald is a cross between a human (a being containing a fragment of the dark soul and light souls) and an everlasting dragon. She will tell you “I was born of dragons, contrived by men. By ones who would cozen fate herself… They are the ones who created me.” She is referring to King Vendrick and Lord Aldia. King Vendrick and his elder brother Aldia both sought the truth, a way to end the Curse, but through different means. Aldia attempted to uncover the secrets of life itself, and viewed the Undead as a key to this mystery. He kept Giants in his manor and attempted to recreate a dragon. 1. The Undead Citizens who are fuelled by unstable souls, almost as if their souls have been taken out, tampered with and replaced. 2. The Artificial Undead, a patchwork of beings sewn together, trying to create something new and more enduring. 3. The Primal Knights, products of ancient rituals misused. These once human creatures have been transformed into a beast that can withstand petrification and carry impossibly heavy objects like they are paper. 4. The captive undead wasting away in the Gutter who have been soaked in dark, a look into the nature of the dark soul. Aldia eventually succeeded in creating an Ancient Dragon by fusing the soul of a giant with a petrified dragon bone. But this dragon was a false prop, and it could not grant everlasting life to the zealots who followed it, or would not. So Aldia conceived of another idea. Using all he had learned from his research Aldia contrived the creation of a dragon crossbreed; a human baby girl combined with the ancient dragons. This had never been done before. Though Priscilla the Crossbreed is an approximate reference she is different because she was born of the gods, beings of pure light, and a dragon. Her very nature made her the antithesis of life. The Emerald Herald was born to fulfil the role of a Fire Keeper. These women have watched over the land since ages past and kept the flames lit. The Curse is a result of the fire fading, the process of hollowing is the dark soul resuming control of the human. Souls have wills, and as the light dies, so does the will with it. The will to be human, to reason, to think is replaced by naked emotion. Rage, covetousness, greed. These powerful emotions are the nature of the dark soul, and they come to life in ‘hollows’. The light soul is the source of reason within the humans of Dark Souls. The Emerald Herald, as Fire Keeper was made to carry the weight of the human race’s burden. By her very nature she was eternal, through her dragon ancestry. Her human side made her a source of fuel for the flames. The reason the Dark Soul was found last, is because it was the fuel for the flames. We can see this acted out within Dark Souls 1, when a player offers humanity (i.e. the Dark Soul) to a bonfire, it kindles that light brighter. The Emerald Herald holds within her a fragment of the Dark Soul, and like the Fire Keepers before her, she is a draw for the dark soul. Players will bring to her the many souls they have collected, and amongst those will be fragments of the dark soul. But this may not even be necessary for unlike the Fire Keepers in Dark Souls 1, she may not constantly need more of the Dark Soul to burn because she is eternal. We are told that the Fire Keepers are draws for humanity, and that the bonfire kindles through humanity, so in a sense the Fire Keepers are constantly burning on the bonfire to keep it lit. This may be one reason Anastacia wishes so desperately to be freed from her burden, as it is perhaps agony. Aldia may have reasoned that should there be a Fire Keeper who will always be there to tend the flames, then the flames could not die. But the plan failed, fate would not be bested and men were cursed once again. Why it failed is not known, but it may simply be that the Fire Keepers alone cannot stop the cosmic fate that has befallen every kingdom since the Age of Fire. So the Emerald Herald was sequestered away, hidden in the Dragon Shrine behind Aldia’s Manor. It was there that she was raised by the Ancient Dragon who gave her the name; Shanalotte. Shanalotte was left without purpose and devoid of hope. She had been tied to the flames inextricably, but as Milibeth will tell you, the fire shows signs of fading, and the Kingdom is beset by Hollows. So Shanalotte sought a means to free herself from this burden and complete her journey. Perhaps in that lofty prison, a bird came to her or flew overhead and dropped a feather. We are told that Shanalotte imagined a world of boundless possibilities from the mere sight of a feather, and she clung on to it tightly. This feather became a part of her being, linked to the bonfire, and it seemed to serve as her main inspiration for her attempts at breaking the Curse. So Shanalotte manifested herself at the Far Fire, and began to guide the Undead who came to the land, to manipulate them for her own ends, for one who might shatter the shackles of fate and set her free. She waited so long that she became known as the Muse, a powerful force of inspiration for the Undead who came to Drangleic. From her cut dialogue it is implied that though Undead before had been able to reach the Dragon, it had not accepted them, for she says “Now the throne lies within your grasp, surely the dragon will speak to you.” We can be confident that no one had made it as far as we do, because the Giant Lord was said to have been felled by an unknown hero. An emerald flask, from the Keeper's soul. This proves that the flasks are from the Fire Keeper’s soul, and as she provides us with one it stands to reason that she is a Fire Keeper. Furthermore, the Fire Keeper souls in Dark Souls 1 tell us that the soul of the Fire Keeper can boost the power of precious Estus Flasks. We can see this acted out in Dark Souls 1 when we give a Fire Keeper a Fire Keeper soul and the strength is increased. In a very similar way, the Emerald Herald is the main source of the strengthening of our Estus Flask as she grafts shards to it. The Emerald Herald is also our only means of levelling up. 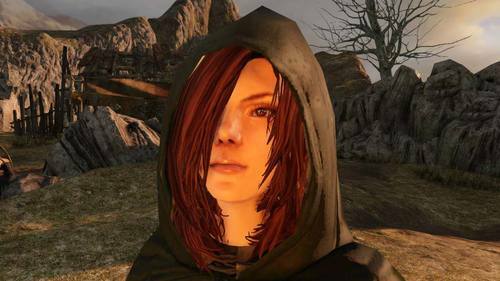 In Dark Souls 1 we were able to level up at bonfires, how is it that the Emerald Herald has this ability then, except that she is deeply connected to the bonfires? Perhaps in a sense, she is the bonfires we come across, as the figure we talk to is only a manifestation. Upon finally gaining the Giant’s Kinship and access to the Throne of Want, bar its final guardian(s), Shanalotte will tell us that her journey is already complete. She now knows that the Throne of Want can be accessed and that the path has been made that much easier by your efforts. No longer is the Throne of Want sealed away from one who might link the fire. With this, she tells you to put Nashandra to rest, and (prior to the patch) once we did that, we had no other choice but to ascend the Throne. The Emerald Herald is the old hag from the introduction. The Emerald Herald is the last fire keeper, tending the Far Fire in Majula. It is possible that the Emerald Herald you see is a younger version of the old hag in the opening cinematic. She reveals that "it was [her] own manifestation that led you here", to Drangleic. It is possible that either the Herald or the old woman are a manifestation created by the other and not actually the same being at separate times. The Emerald Herald is Vendrick & Nashandra's daughter. This is just pure crazy speculation but: it could be that King Vendrick and Queen Nashandra had a daughter, and that daughter was Shanalotte. If they did have a daughter it would perhaps be a perfect embodiment of the light and dark, as Vendrick's soul burned brightly and Nashandra's burned dark. We know that Aldia experimented on live citizens instead of somehow creating them, so it would make sense that he experimented on a live baby girl, perhaps infusing her body with the soul or essence of a dragon. 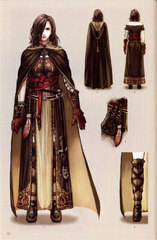 It would also explain why Vendrick, who knew the true nature of Nashandra, did not reject her, at least for some time. Perhaps she was also part of his experiments to find a way to end the Curse. The Emerald Herald is your 'Dark Queen'. This theory proposes that she is a daughter of Manus. Every king had a queen, and every queen so far has been a shard of Manus, seeking power to get revenge for his defeat by humanity in the events of AotA in DS1. Each queen had different tactics; Nashandra seeks the throne of want and the power of the golem and the first flame, Elana sang to the dragon sinh to fill his heart with poison, corrupting him for use as a weapon and Nadalia came to Brume tower to claim the power of Iron, specifically the ability to imbue life to steel given by the iron sceptre (maybe even claim the planned iron dragon? See the iron sceptre description). This also tells us that the queens, as they are mere fragments of Manus and only have but a fragment of his power, have to be shrewd and manipulative in order to achieve their goals. Only one, however, has been overwhelmingly successful, to the point that she has surpassed and eliminated her "sisters" as competitors as queen to the most powerful king of light. Aldia was influenced by Seath's work when creating the Emerald Herald. Assuming that Shanalotte was created by Aldia and Vendrick ("ones who would cozen fate"), it is possible that Aldia based his creation on Seath's creation, Priscilla. 1. Both are associated with Dragons (Priscilla is half-Dragon and Shanalotte was "born of dragons"). 2. Shanalotte gives us a black feather, similar to the feathers of the Crow Demons of the Painted World. 3. Aldia and Seath were both scientists who created monstrosities using living beings as test subjects. "Bearer of the curse, seek misery. You will never meet the King with a soul so frail and pallid." "Seek those whose names are unutterable, the four endowed with immense souls. So that hope will not fade away." Lest this land swallow you whole… As it has so many others." "Is that a shard you've found? However faint it might be…"
"You have acquired the soul of an Old One. That is more than most Undead can say." "The soul and the curse are one and the same. I only hope it brings you what you wish." "Proceed, bearer of the curse. It is the only choice left to you." "You are blessed with a myriad of souls. Bearer of the curse, make your way to the castle." "Bearer of the curse. I will always be at your side. Until hope has fully withered…"
"Over the hill and past the forest is the King's castle. But what ever came of it…"
"Those who come to Drangleic seeking salvation soon lose hope, and turn Hollow. His spirit is already broken. Although he does offer sound advice. Perhaps he is a foreshadowing of your own future?" Provided you find her on a good day…"
Not all Undead are Hollows, but all Hollows were once Undead." "If you find an Estus Shard, bring it to me. So that I may ease your burden." But I will not stop you, if that is your heart's desire." "This ring is the symbol of the King. Do not resist. The dragon welcomes you." "My journey is already complete. "If that is your wish…"